Berlin Township is asking its residents to approve a 2.95-mill, five-year, levy for the fire department. The focus of the levy is to increase the manpower and replace equipment, said Assistant Fire Chief Joe Pichert. 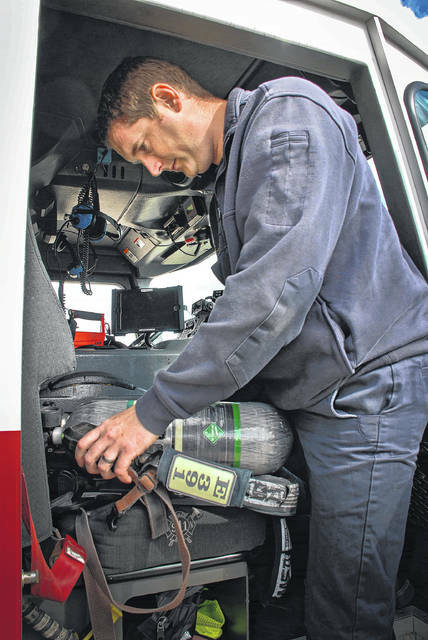 Pichert is shown running a a daily check on a breathing apparatus before it is needed in the field. Berlin Township is seeking voter approval of a 2.95-mill, five-year fire department levy on Nov. 7. If approved by voters, the levy will be in addition to the existing 2.98-mill levy that was passed in May 2015. Pichert said that the two separate levies will be collected at the same time. Pichert said the department’s service area is “22.5 square miles” with “7000 residents” and is quickly growing with the addition of the Evans Farm housing development and the new high school, Olentangy Berlin. He said he thought the average cost of a home in Berlin Township was around $265,000. According to the information sheet, Berlin Township’s fire department is funded exclusively by the existing 2.98-mill levy and if passed, the 2.95-mill levy. No funds are used from the township’s general fund to support the fire department. Pichert said the department employs three full-time and 23 part-time professional firefighters. The passage of the levy will allow the department to increase the number of firefighters on duty from two to three, at all times, seven days a week, 365 days a year. Pichert said the board of trustees established a fire committee in 2009. Their recommendation was to replace the out-of-date equipment and add firefighters by seeking an additional levy. Pichert said the department has worked to establish a replacement schedule for equipment so that the cost doesn’t hit all at the same time. The Delaware County Board of Elections Vote Center is open for early voting through Monday, Nov. 6. For information about Vote Center hours, visit delawareboe.org. This entry was tagged Berlin Township, Delaware County Ohio, Fire Levy. Bookmark the permalink.